Dear intending visitors of TamraPothi: After four decades of service provided by Pt Mishra through TamraPothi, we regret to inform that the regular services cannot be provided anymore. Therefore, we strongly discourage visitors. Please DO NOT visit to seek Pothi anymore as services and available dates cannot be guaranteed. This page is maintained for record only. After a recent uprise in information related to TamraPothi, the number of visitors became unmanageable and many had to painfully wait several days for seeking, several seekers were under time-constraint with booked return tickets and went back empty, some people tried to exert influence or show elevated emotions and several people did not get a chance to seek due to unavailability of Pt Mishra related to his old age and frailing physical conditions. We have also heard about grievances and accusations stating that they did not get a fair chance to seek many of which is simply because of lack of enough time for everyone and one's own patience and Pt Mishra's aging. We do not have any agents or disciples at Pothi Ashram to deal or negotiate terms with visitors, neither we maintain a modern premise with comfortable facilties nor do we run this for-profit. There is only one simple caretaker to maintain the premises and no other external agents. This is a low-key non-commercial spiritual service gifted by The Great Seer Mahapurusha Achyutananda for his devotees, and run under instructions from Sri Achyuta's disciple Baba Buddhanath Das, and never will be a saleble service; the only driving force ever has been 'Sri Achyuta's Compassion' for humankind. A brief definition: Tāmrapothi is a device which reads your thought-process to get the question you want to ask, and then provides suitable answers to your questions on blank metallic plates. The answers are inscribed only temporarily, and as soon as you close the Tāmrapothi, plates render blank again. There are also Oracles of Shri Achyuta apparently made up of other metals (gold, silver). The questions, in these oracles, can be asked in any language existing on this planet- language is no barrier for Shri Achyuta's divine instruments. 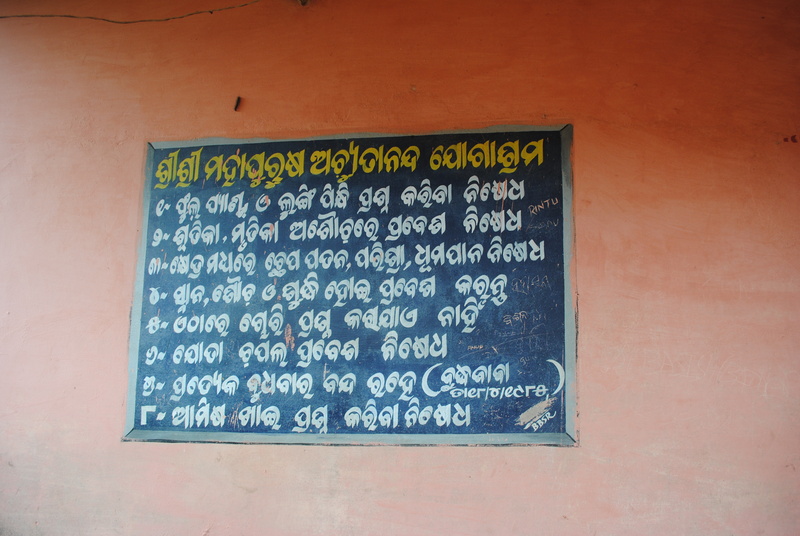 However, Tāmrapothi provides temporarily inscribed answers in Odia (Oriya) script only whereas as other Oracles can offer multiple language scripts. What to do after you reach ? How to ask a question ? What is the fees ? From where the pothis were recovered ? Tāmra means Copper and Pothi means an oracle. 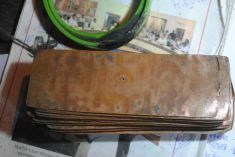 From a simple external and physical point of view, the Tāmrapothi is a small book-like object consisting of fifty-four copper plates (~ 3" x 8"). When one goes there, and thinks about any question or puts the question written on a paper under the Tāmrapothi, the answers to the questions are temporarily inscribed on its pages. The thinking process or putting the paper-containing-questions is started after a short ritual (by the Brahmin who operates the pothi) which takes about half-a-minute. The answers are inscribed instantaneously and after the book is closed, they all disappear. The answers are read by the Brahmin who operates the Pothi; but on a formal request one can see the letters by himself or herself. The answers come in the form of ancient old-styled prose, and the Brahmin interprets them and explains after reading the prose aloud. As the letters/scripts are very small and the inscriptions are not too strong, it is usually read using a magnifying glass (lens). It is normal that one has questions and at times seeks some timely solution. The Tāmrapothi at Kākatpur is a rare phenomenon, to the astonishment of many strictly scientific-minds, which serves the people having some needs. The barrier of language is nothing but a human-limitation. But for this divine-device, the language is no limitation. One can think the questions or write it in any language. 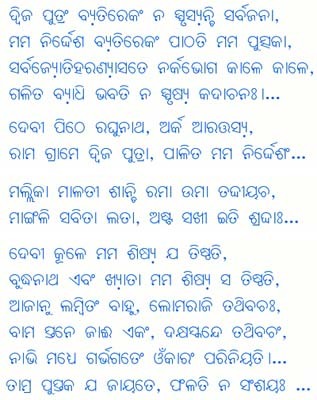 However, the answers on this particular Tāmrapothi comes only in Odia (Oriya) language. You got to have a translator (from Oriya to your language). There is another pothi , made up of different metal, which can receive and give answer in various other languages (discussed somewhere later). 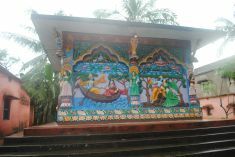 The point here that you might want to delve deeper in your thoughts is that it's not about the metal or palm-leaf that Sri Achyuta employs for giving his wisdom but its about how. We have attempted to answer this 'how' in the section 'how the Pothi works? ', which is given subsequently, after seeking to Shri Achyuta himself. However, for obvious reason, it is impossible to exactly know the details of the implementation, including for Pt Mishra himself. Shri Achyuta said: 'A Siddha Shunya Sadhak can do this and make the alphabets appear anywhere, the set of copper plates is just a medium'. Understandably, a set of metallic copper plates is not very worthy in themselves, who is really working here is Shri Achyuta himself in his ethereal form. It is Achyuta's Mantras given to Pt Mishra that helps to activate the Pothi and by the will of Achyuta only, the answers appear. 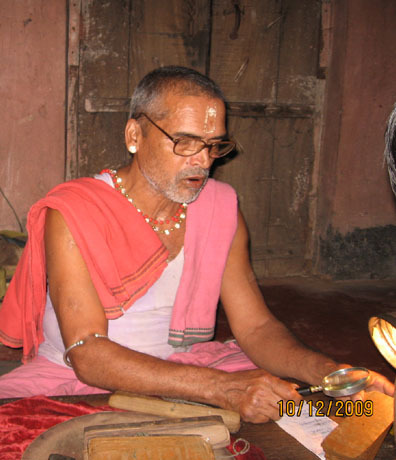 The worthiness of the Copper Oracle of Shri Achyuta is that it belongs to Shri Achyutananda himself. 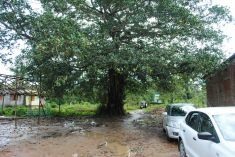 The place is situated in the front end of Kākatpur, a small town (moderate village) in Odisha (Orissa), India. 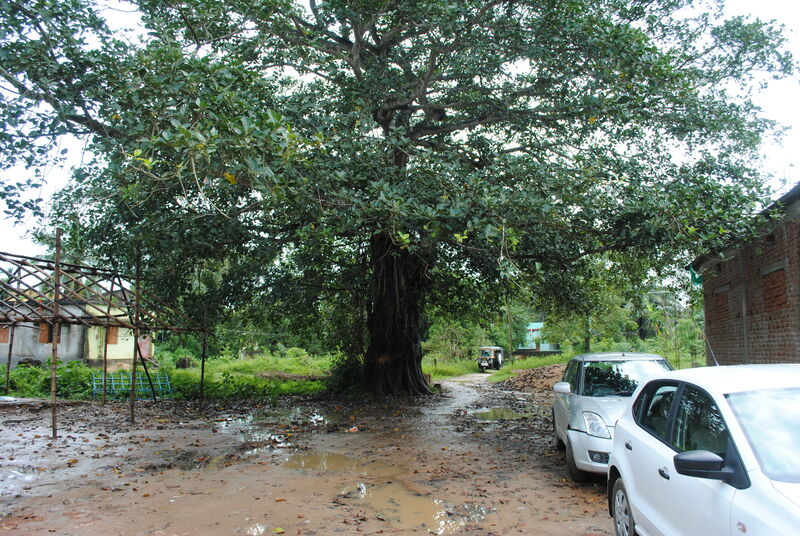 The nearest major town is Pipili, approximately 20 kms from Bhubaneswar, capital of Odisha (Orissa). 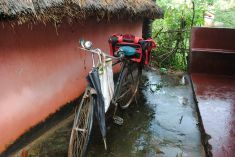 From Bhubaneswar to Pipili one can take a bus, and from there to KāKatpur, there are some inconvenient conveniences. If affordable and you are in a group, it is better to take a TAXI. 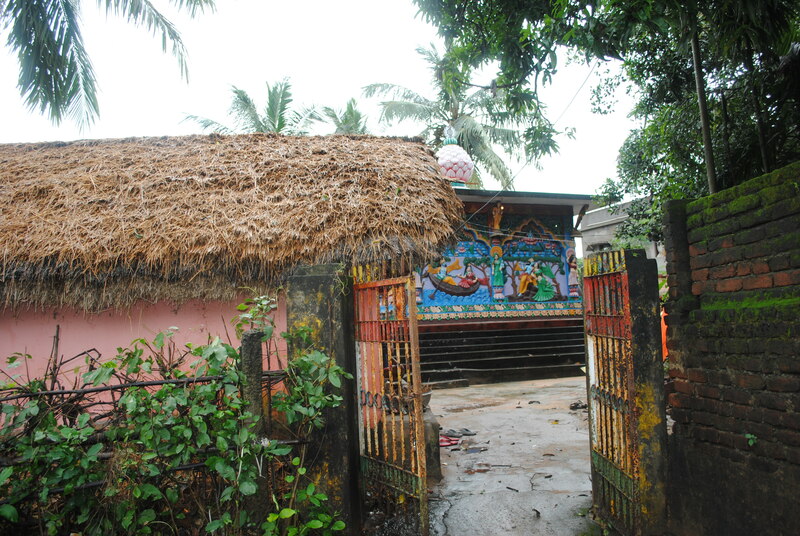 The small Ashram (a hut) is situated at the front-end of the village, just facing the town School. As it is a small place, and has only one school at the front-end, you cannot miss it if you reach the town. To view the exact location (map) and satellite image of the area, please follow the links provided in the sub-menu at the top of the page. PS: It is closed to public on every Wednesday, days-of solar or lunar eclipses, and during functions/events in Garoi ashram. After you reach there, you first have to enlist your name and then wait till your turn comes. How long you have to wait depends on how many people are already there in the line. The preferable time is early morning, so best is to try to reach at about 7.30 am. Then you have a good chance to have your consultation completed before 10.00 or 11.00 am. Please note that, the service here is on a 'first come, first serve' basis. This is a low-profile but a high impact (due to historical reasons) but one of the high impact spiritual centers of Sri Achyutananda Das and not an on-demand service center and there is no log-book or reception counter to have your name included. All are equal for Sri Achyuta and there are no dignitaries with special privileges (familiarity may become helpful because of human fondness but your influence and power will not). Therefore, to have your name included, when the door of the inner room opens, just please request Pundit Mishra to include your name. We believe that this is just because everyone will get equal opportunity to seek; provided one arrives early, his or her turn will come earlier regardless of your social status and capabilities. When your turn comes, your name will be announced. Please get inside the inner room after wearing some clean clothes (preferable is typical old-cultured Indian dhotis). The gents have to wear such a dress as it might not work with the largely-used trousers and pants. The ladies can wear a Sāri or traditional ladies-dresses. Make sure that you did not take non-vegetarian food or alcohol the day you are seeking as the Tāmrapothi will stop working till it is again enlivened by the operator. 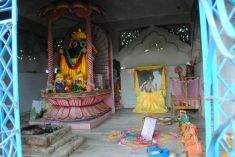 You can see there Pundit Amareswara Mishra along with the Tāmrapothi. The Tāmrapothi is a bunch (54 precisely) of thin copper plates. These plates are all blank (there are no letters except some Yantras or Symbols in each page) and collectively are all kept on another larger sized metal plate (a Bhubaneswari Yantra is inscribed on it). 1. Hold a piece of chalk (will be provided there) and touch it with the forehead; then think of your questions that you want to be answered. Then put the chalk on the Oracle and open any page. The answers pop-up starting from the page you open. 2. Write your questions on a paper, fold it, put it underneath the Oracle and on the Bhubaneswari Yantra. Then touch the provided chalk in your forehead and request mentally to answer the questions and open any page; the answers will pop-up. (see photo below of the various parts). Even if you write your questions in a paper, fold it so that non one else sees your writing. However, it is important that you still touch the chalk in forehead and make a mental request with respect or atleast with modesty. This mental request process forms the link between you and the Oracle. How much to pay ? The answer is: as you like. There is no fixed rate, no price, no demand, no verification. The service is for free, but the Brāhmin, who spends his entire day for this service, has to live and maintain his family and survive. As per Sri Achyuta, the one who serves can receive some Pārishramika (remuneration) but cannot charge or demand money, nor can judge anyone based on the remuneration. There is a small cloth, on which you can put whatever amount you feel like, depending on your satisfaction, will, and financial abilities, just before you leave and after your seeking is over. How the pothi works ? By choosing to answer this question, which rather is very abstract, the authors have chosen a difficult task. Because, only a mystic knows the mystery of his mysticism. But below is an explanation which was partly answered by the divine itself and partly by one of the five disciples of His Holiness Baba Shri Buddhanath Das. The working principles are similar for all of Shri Achyuta's pothis and are described below in a common perspective. 2. There are YANTRAS and MANTRAS; the technical aspect. The following answer was by the divine (English translation of a theme from the tâmrapothi) after the question was put by the author. 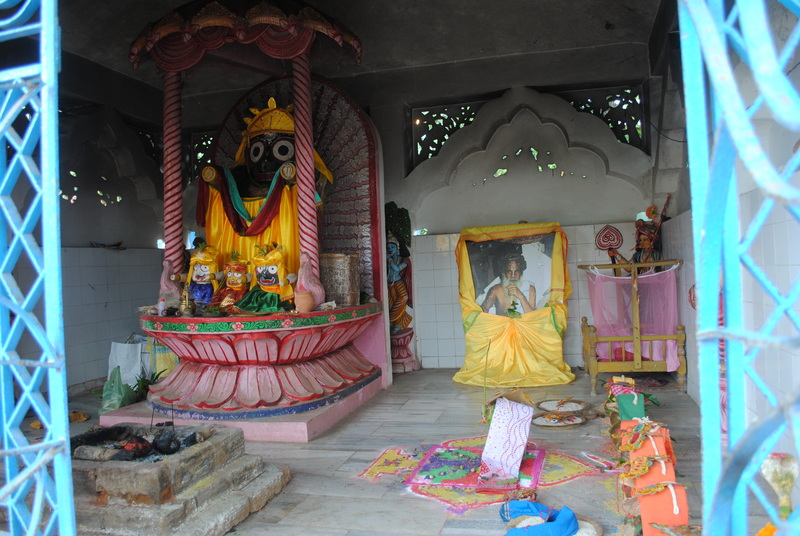 The answers in the Tāmrapothi are given by Mahāpurusha Achyutānanda vide Lord Jagannāth. At that time (~500 years before), in Orissa, there were no proper medication facilities and other life-saving and problem-solving avenues. Hence, this Tāmrapothi was instrumented by Mahāpurusha Achyutānanda as a divine gift, specially for suggesting Ayurvedic medicines that will be affordable and available to the seekers. Even though medicine was the primary focus, it was/is capable of providing every type of solution. He had instrumented it in Odishā or Orissa (Udra desha) but the Tāmrapothi's service is for the whole mankind. It remained hidden for a while (a few hundred years) and is again recovered at this time, by Sri Achyuta's inspirations, to do the some of his foretold and crucial Yugakarma (duty of the era). 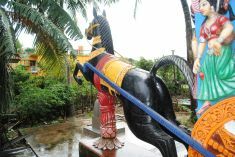 Mahāpurusha Achyutānada is a Shunya Sadhak. This sadhana, in a simplified sense, means: to reach the Sun, which is a symbolic for the ParamBrahman, with one's soul. One who can reach the Sun with his soul and come back, gets the ability to know the answers to everything in the Universe (Biswa Brahmānda Gyāna). He also gets the ability to enter to any other body living or non-living (Jada athaba Jivanta). In this way, he (Mahapurusha) answers in the Tāmra pothi and the Tāmra pothi has the instrumental capacity to survive one solar-era (i.e. till this Sun is there the pothi can work, until he himself wants to take it back). Also who has become successful in Shunya Sadhana has no limitations regarding language, as language is only a human-limitation, the thought-waves are all the same. The Sun, as we see it, is not a stand-alone naked body. It has 10 different layers or rings (solar layers). When a Sadhak performs the ShunyaSadhana, he successively penetrates each of the layers. Each layer has its own property, and bestows different knowledge. By doing this sadhana, Mahapurusha Achyutananda had acquired every knowledge. No wonder, the Pothi answers to every question, be it spiritualism, illness, Science, or society. One who succeeds in ShunyaSadhana, has no limitation anymore, he can be emerged in God and also can maintain his/her own identity. In another language he becomes a part of the Parambrahman. This was also the reason, that he had written (could write) so many literature, including concept of body-spirit-soul, atoms, molecules, nuclear science, solar science, space science, and very high spiritualism etc. The Shunya Yantra is a symbol which offers this knowledge; if one sees carefully it consists of ten circles representing ten solar layers and the dot (bindu) representing the parambrahman. By virtue of this ShunyaSadhana, Mahapurusha Achyutananda has instrumented this answering device in the form of a pothi. Practically, he could make it in anything (living or non-living), as a ShunyaSadhak acquires these capabilities. The Tāmrapothi is kept on a Bhubaneswari Yantra made up of Copper. In all the pages of Tāmrapothi several Yantras are inscribed. When the Mantra are applied to Yantras of Tāmrapothi, the Yantras disappear and the thinking of the person and his query and answers are inscribed as letters in Tāmrapothi. The same is the case for other Pothis of Shri Achyuta. Tāmrapothi inscribes only the Oriya scripts whereas other Pothis offer multiple scripts. The detail procedure is narrated subsequently. A : The pages of Tāmrapothi. To receive the answers, the questioner opens any page and answers are instantaneoulsy inscribed starting from that particular page and runs into the following pages. The number of pages in which answers are inscribed are not fixed and depends on the volume of answers, Usually four to eight pages can be expected. 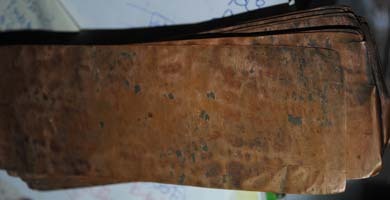 B : Another set of palm-leaves pothi in which Mantras are written. 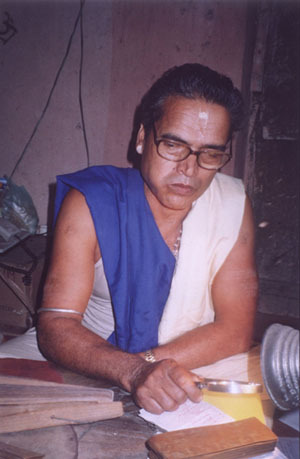 These Mantras are applied by Pundit Amareswar Mishra to activate the Tāmrapothi each time before a seeker asks questions either written in paper and folded or thinks in his or her mind. C : A concave plate of metallic alloy on which Bubaneswari Yantra is inscribed. 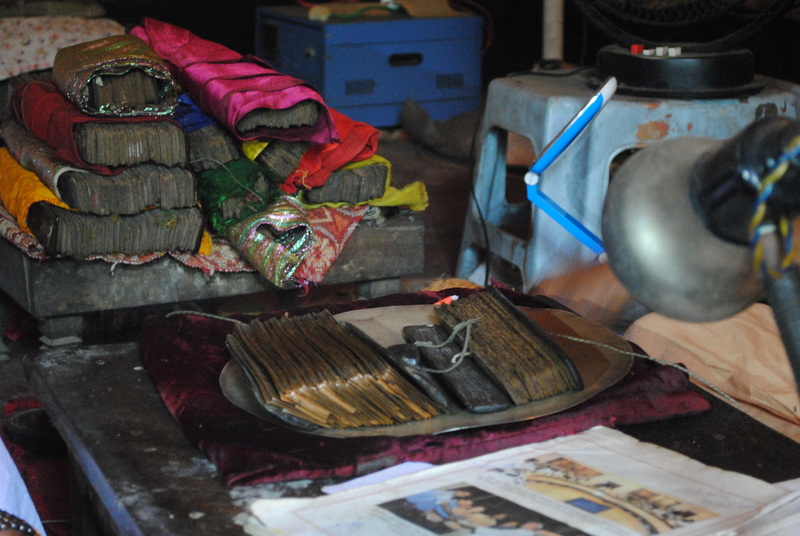 The Tāmrapothi (bunch of 54 plates) is kept on this Yantra during the process enitre process. D : A seeker had written his questions on this paper. 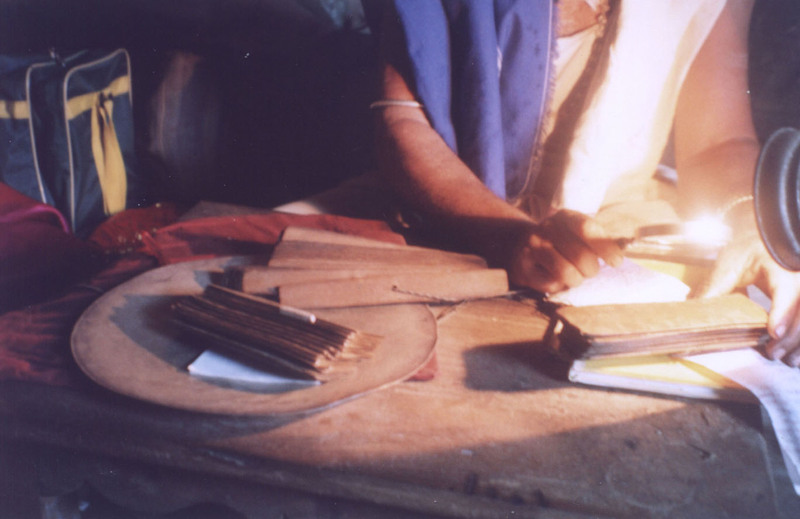 The paper is folded by the seeker and is put underneath the Tāmrapothi and on the Bhubaneswari Yantra. E : A piece of chalk that muct be touched on the forehead by the seeker and then be put on the Tāmrapothi before a page is opened. This process makes mental link between the seeker and the Tāmrapothi. How Tāmarapothi works (continued from the paragraph before the Photo): Some explanation of the working technique behind this unusual phenomenon has been attempted by one of the five disciples of His Holiness Baba Shri Buddhanath Das, and is given below (please note that this is just a personal opinion and only Sri Achyuta knows how he instrumented his Oracle). His holiness (Mahapurusha Achyutānanda and Baba Shri Buddhanath Das) use to answer via Shunya Pothis handled by Pundit Amareswara Mishra at Kakatapur, Orissa, India. According to my conception, it has a mechanism similar to that of a television. As we know, a television set has a machine (Yantra) which, through Antenna (another Yantra), receives the photos and the voice (as electromagnetic transmission) and applying energy (electricity) we are able to see the picture using a picture tube (Yantra) and hear the sound. Likewise, the pothi is kept on a plate on which Bhubaneswari Yantra has been carved. You may think of it as the machines of television set. Pothi consists of several plates, and several Yantras have been carved on each of the plates of the pothi. Pundit Amareswara Mishra (popularly and locally called as Bhaina) uses a Tālapatra-pothi (palm-leaf pothi) where mantras have been written (see photo above). He applies those mantras to the pothi. The Yantras disappear the moment energy is applied to it and those lines are converted to letters and a person could read the scripts. Then the question arises how the answers come from space and how the Pothi reads the mind of the person who is seeking: all the thought process (thought waves) of a human being and the work he had done has been transmitted to the space (in a subtle frequency domain) and stored therein. The time a question is put, the thought process is transmitted to the space and through pothi one can know the questions put, and the Yantra brings the answers from the space which has already been stored therein. The truth is: all answers are already there somewhere (spiritual people call it Shunya or 'The Vaccum') and it is grabbed forcibly by some means. Nothing is new or was not known before, the question is when you know it. Ram Das (one of the twelve previous incarnations of Baba Shri Buddhanath Das) was the only disciple of the Mahapurusha Achyutananda, who was able to read the mind of his Guru through his Bhaba (feelings). His Guru had invented this procedure and the execution part is done by Ram Das. Guru and Shisya are one and the same. Having two bodies and one Bhaba and thought process. As you know Baba Buddhanāth Das is the 13th birth of Ram Das. If anything is not stored in the space the question of the questioner directly comes to the mind of Baba Shri Bhudhanath Das who sends the answers to the space and pothi attracts the same from the space and Bhaina could read the same. 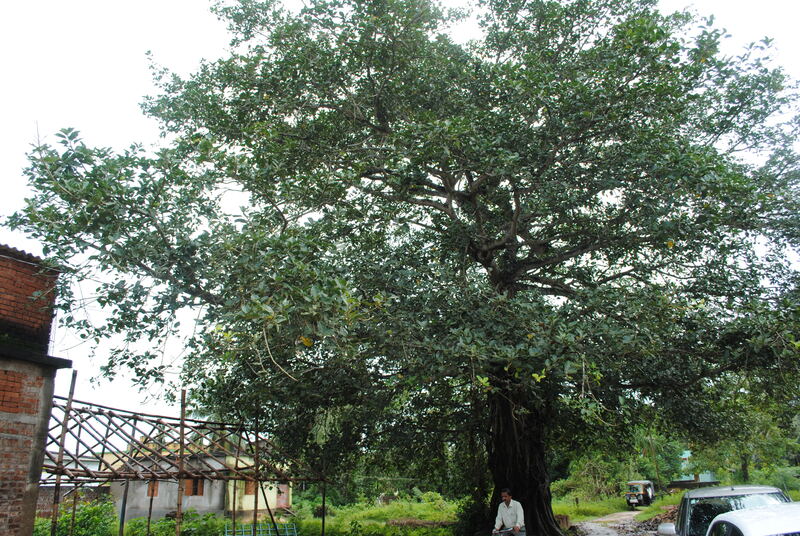 I am having the knowledge of several pothis in Orissa and one pothi in the South (of India). I have no detailed knowledge about the South-India pothi. Among the pothis discovered in Orissa, it appears that all of them belong to Mahapurasha Achyutanānda except one that belongs to Nabaratna (nine Gems) of king Vikramāditya. 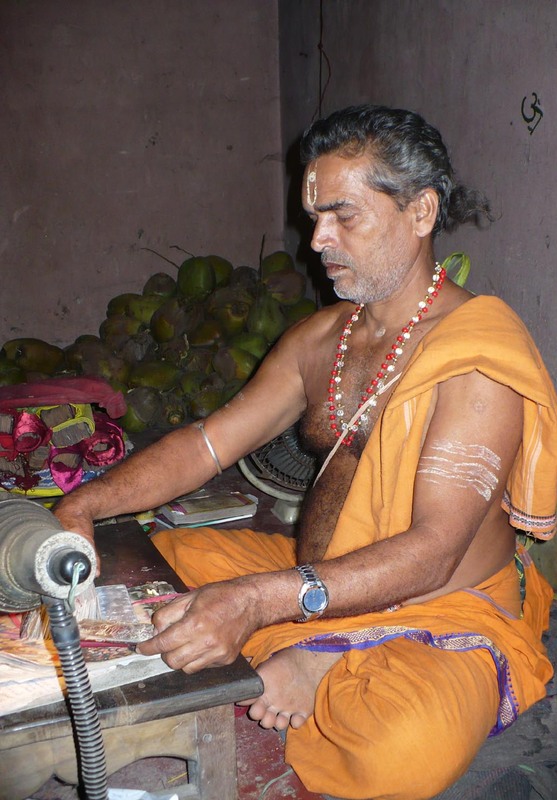 There can not be any dispute regarding the techinque but the operater of pothi has to apply the energy (Mantra) perfectly to revitalise the Yantra to letters. The operator should be a Sadhak to apply the Mantra (energy) to the Yantra (machine). Since all of them are not able to do this perfectly, so always the true answers are not coming on pothi. 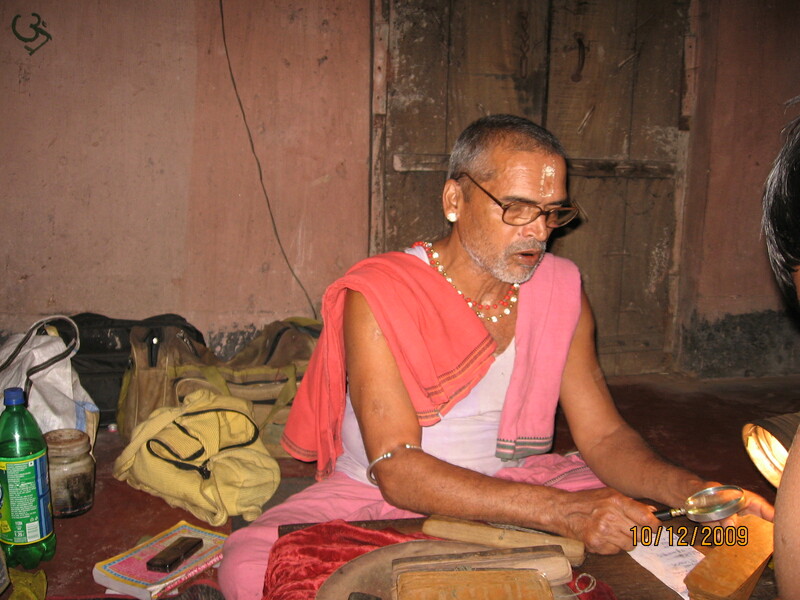 Mahapurusha Achyutānanda had written thousands of books, but in fact he had not himself written all, the moment he thinks about the subject, Ram Das used to write the same immediately on Tālapatra pothi (palm leaves), Tāmra pothi (copper), Roopā pothi (silver) and Sunā pothi (Gold) by means of Pancha (five) kalam (pen). In the high resolution larger picture, if you focus on the right side of the photo, you will see the scripts, which seem like handwritten. The plate was tilted and illumination was unenven along with some reflection from the copper plate, hence the camera did not capture the left side. However, fortunately for us, the right side shows the scripts with somewhat feeble impression. 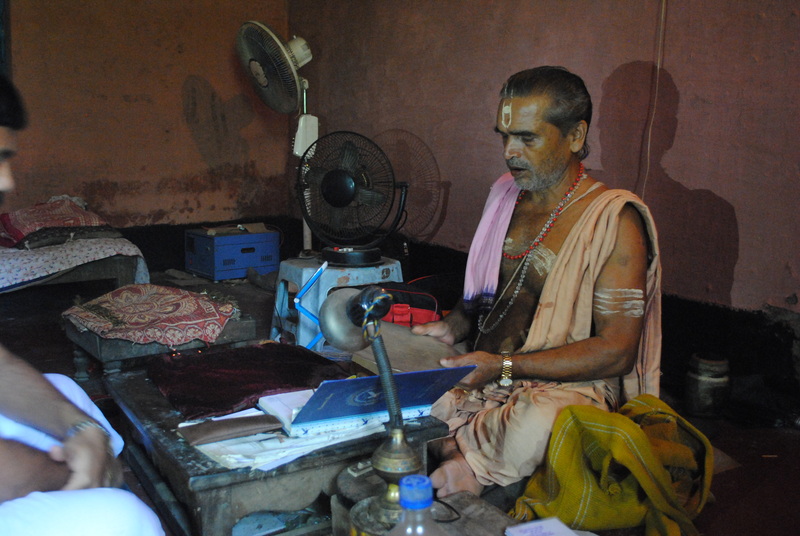 Pundit Amareswar Mishra reading Tāmrapothi in his Kakatpur Ashram. The Tāmrapothi of Mahapurusha Achyutananda is handled by him at the instructions of Baba Shri Buddhanath Das. Where from the pothis were recovered ? 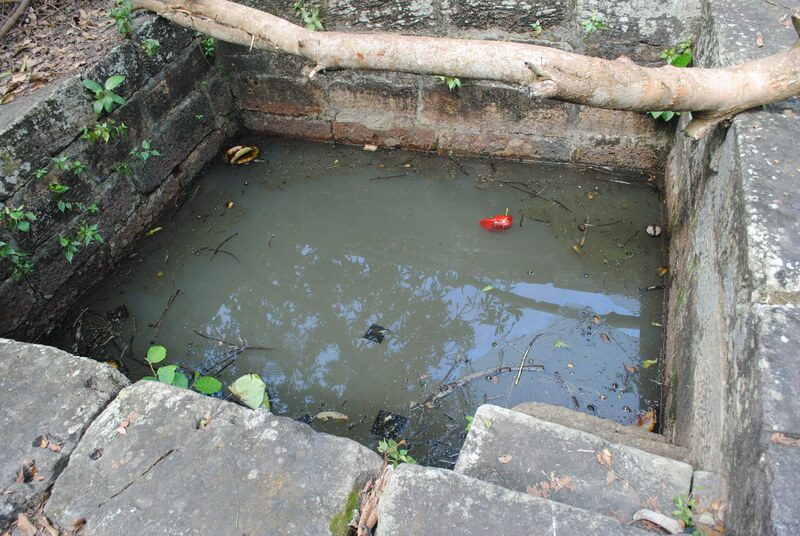 The well at Konark Abadhut Ashram from where Tāmrapothi was recovered. The Yantra worshipped at Abadhut Ashram; no specific Murtee (idol) is worshipped. 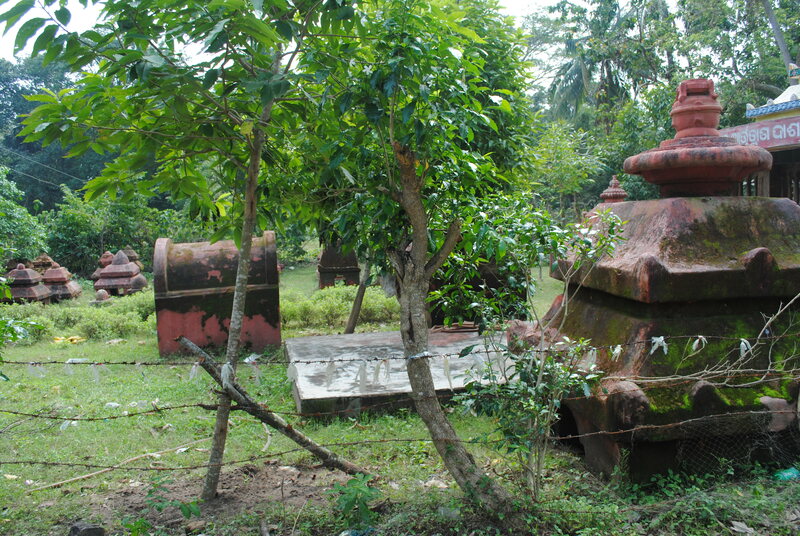 Samadhi of Abadhut Sādhus in the lineage (~5000 years old). The Dhuni (sacred fire) inside the inner sanctum of The Abadhut Ashram, many 1000s years old. 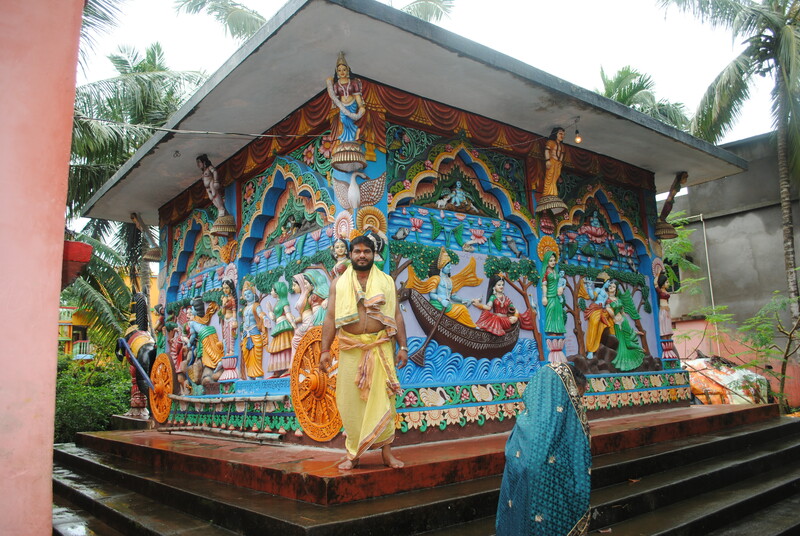 Under Sri Krusna's advice, Sāmba was believed to have prayed to Lord Surya here and got rid of his Leprosy. 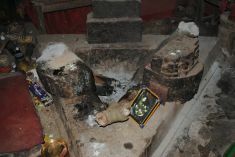 Adjacent to the Copper Oracle, there is another small Pothi, comprising palm-leaves with pre-written text by Sri Achyuta. 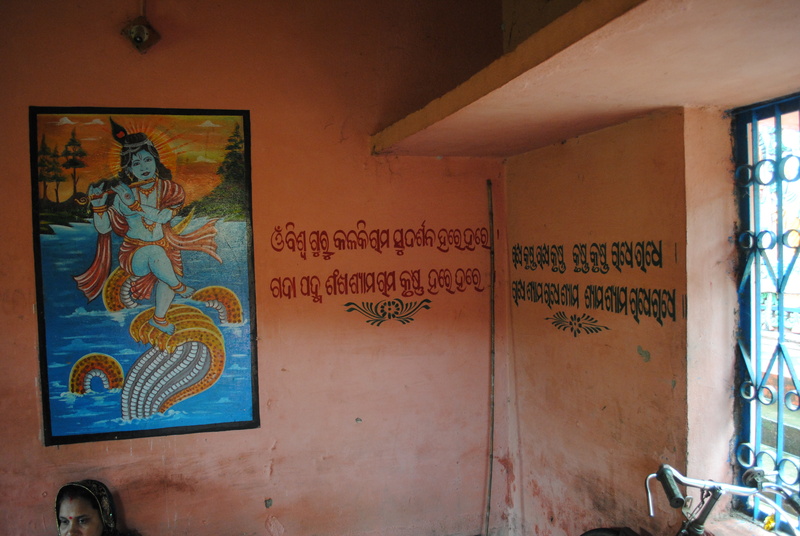 The text is written in Sanskrit language using Odia (Oriya) script. This text briefly describes the circumstances when Sri Achyuta made this Pothi and there were Ashta-Sakhis who assisted him. It is also stated therein that the Pothi will be at the Arka Khsetra (land of Sun), which is a name for Konark, where one of his own persons (Arta Baba) will be the presiding seer, while following Sri Achyuta's his instructions. He also mentions that his disciple (Ram Das) will be there in this time in the name of Buddhanath and briefly describes how his disciple's physical appearance will be. Sri Achyuta also wrote that it will be operated by a Brahmin and strongly warns anyone else to attempt to operate his Oracle without his instruction, else there will be severe physical and spiritual consequences. He also mentions, if one seeks with faith and focus, the Pothi's instructions and answers will hold without doubts. More details about the Pothi, relation of Sri Achyuta's to Baba Sri Buddhanath Das and Pundit Amar Mishra is described by Achyuta in one of his literary works (Parardha Khanda). 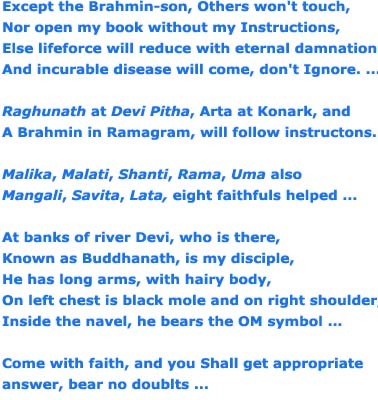 Upon request, Pundit Amar Mishra kindly narrated selected parts of this pre-written text (click here for audio). We have made an attempt to write parts of the pre-written text below, along with it's English translation(interpretation in another language might result in loss of original poetic feelings and intention). In the above pre-written text, the origin of the Pothi has been described by the Creator himself. He, out-of-compassion, made this Pothi for the welfare of the general People, primarily for medicinal purposes that time. He also identifies Baba Buddhanath Das (Ram Das) as his disciple and Pt Mishra as the one to handle the Pothi. However, he issues strong warnings against misuse of Pothi for personal gain or any attempt to operate it unauthorized or by force. Both Baba and Shri Achyuta have given stern instructions that this book of mine is for my work towards societal benefit and not to be used as a revenue generator, in which case the Pothi will stop working. 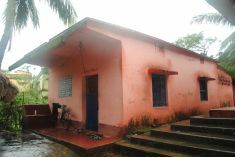 Sometimes we have been criticized for lack of facilities that money can buy, as compared to those available in many flourishing centers throughout the Indian sub-continent. The point here is Shri Achyuta is beyond materialism and everyone is equal for him, i.e., there are no dignitaries based on position or money. The Devotees are dearest to him, that's all. If one does not like this or disagrees, then please feel free to go where you feel more comfortable- Shri Achyuta's principles will never bend. Shri Achyuta also warned that no one other than the one chosen by him should attempt to possess or operate the Pothi. The warning includes consequences of serious nature including incurable disease and eternal damnation. In short, divine powers are not to be misused for personal gains or societal exploitation but only for a greater cause of the welfare of the society and any departure from this spiritual law will result in consequences beyond human reach. Note: Please click on the link next to a title from below, to choose a theme. The files with wmv format are compressed in order to suit playing over the internet. For playing the mpg files, rightclick and download to your local disk. For initiating the Pothi for a specific person, the person has to tell his name only and the Pothi is activated for that person. This process of activation is the necessary first step for asking questions (recording: 2004). After the ritual, a person can ask questions (written on paper and subsequently folded, or mentally ask by touching the chalk on the forehead). Then the answers come from the page opened by the seeker. This shows how the answers come in pages and Pundit Amareswar Mishra reads and explains the answers (recording: 2004). While touching the Chalk on forehead, the seeker must think in mind for a few seconds and mentally request Mahapurusha to give answers. It is important to make a mental contact. Rarely it may happen that, if one just touches the chalk on the forehead without making a "brief" mental request and puts the chalk on Pothi to open, then there will be no answer. Here, the denial comes in the form of a Yantra (2 circles at one center, lotus petals inside the circles, and 1 triangle). Then Pundit will allow to ask again and the ritual is also repeated. For those who do not know who Shri Achyuta is and whom to request mentally, just think with modesty, "Please answer my following questions" (recording: 2004). The images and video clips are copyrighted; you may use it for informational purposes elsewhere, but a clear reference must be provided to Garoi Ashram and this webpage. A few selected videos are uploaded on Youtube (as shown above) for travellers' awareness and convenience - and for a time in the future when such privileges will not be there anymore and this fact will be thought of as a myth. This, however, is not to be construed as an interest towards any sort of advertising or even remotely convincing the contrarians (they are relatively right as per their own model of (mis)understanding the truth!. The sad thing is even if they spend their lives in search of truth, which we genuinely appreciate, they miss a turning point. If one is interested or in need, he must put the effort, thats it!, and its not up to us to alleviate their limitations, satisfy their demands, and remove their ignorance. Shri Achyuta does not need anyone's approval and there are enough people who genuinely need help and we look forward to serve them, until Sri Achyuta withdraws his own instrument once his goal is reached. Sometimes, we receive questions/invitations: "Can the Pothi be taken to such and such place; we will arrange and pay for it?". The answer is "we do not know!". The question MUST be asked to Shri Achyuta via his Oracle, and if he permits, only then can it be taken elsewhere. Your financial abilities, modern facilities, and technical marvels may be fascinating and on top of the world, but are meaningless to Him; only if there is devotion and a higher purpose, he may allow. The attempt to lure "Nitya" (eternal) with "Anitya" (transient and mundane, e,g., wealth) is futile- what is Nitya (eternal) is Satya (truth)- and Achyuta is the unfailing eternal soul. No one, including Pt Amareswar Mishra who operates the Pothi, has any exclusive authority to decide over the Pothi. Shri Achyuta has told, "I will answer everyone who seeks, but I also do see their intentions". He prescribes remedies, if there is any, and guides, but never interferes directly exercising his spiritual powers. Direct intereference goes against the principle of the creation. If one follows his advice, one will find relief, but the seeker must act. He won't avert the death of a person if Kāla is there, destroy seeker's competitors, or force people to go against their own will. "Devotion, faith, compassion, patience, and respecting the cosmic laws are the qualities of a true yogi". Some people, even without having ever seen this, and out of their limited experience & understanding say: "Why an Oracle? Ooo (mockingly), if he is that accomplished why he does not appear physically and just talk?". Such provoking challenges are non-sense. Firstly, he has said, "Oracle is just a medium but a Sunya Sadhak can also write on anywhere, e.g., a piece of wood". But its understandably better to have a consistent way (repeated in the same manner) to let people know what and where to go. Secondly, why should Shri Achyuta (or, for that matter, The God in the form of Vishnu or Shiva or Father) appear and talk to us ? Are we that important and ready for that, huh? He is already kind enough to provide a material medium (pothi) to seek his wisdom. The informational page has been designed to let people know about Shri Achyuta and the people in need to find possible remedies, and should not be construed as an attempted convincer. The uneven earthy Path in front of the Pothi Ashram. Same as before (parked vehicles of distant visitors; local people can walk). Baba Buddhanath Das's photo placed inside a small temple as per Sri Achyuta's instruction. 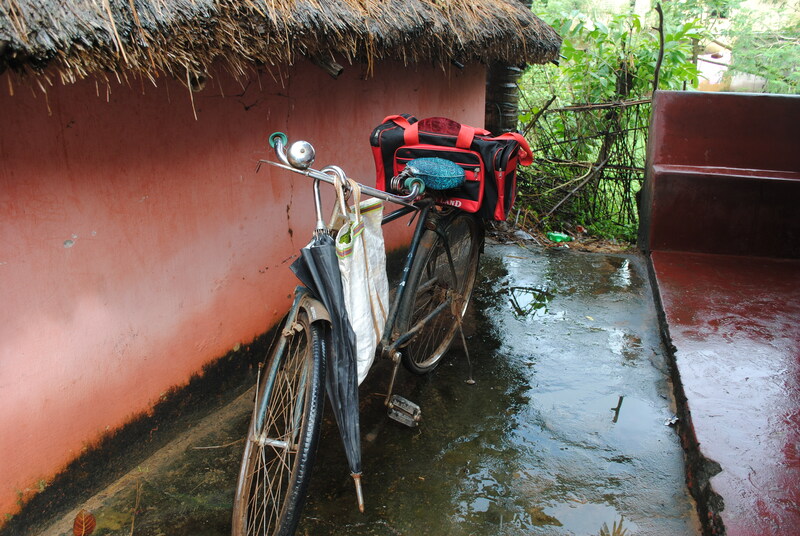 The bicycle of Pt Amareswar Mishra on which he carries pothi. The small ashram with one waiting room and one consulation room. A painting on wall of the small waiting room. 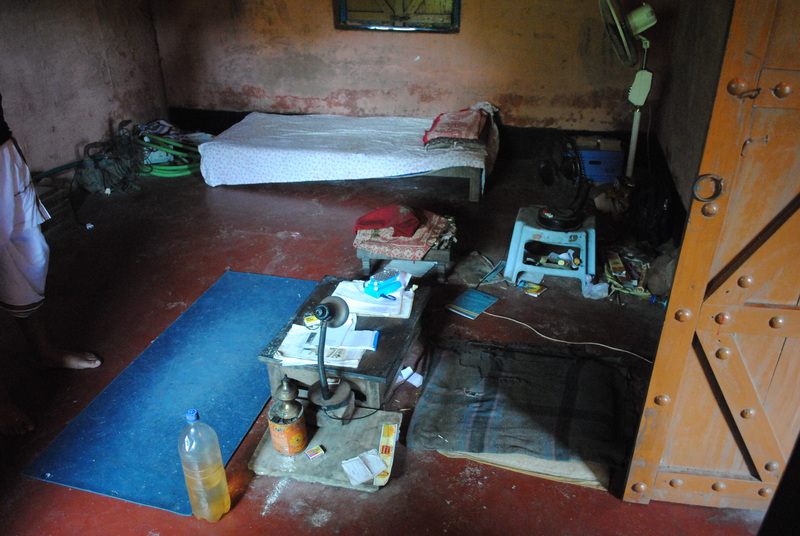 The small inner room where Pothi consulation takes place. Other pothis that at times are referred to. The small temple adjacent to the Pothi consulation room. 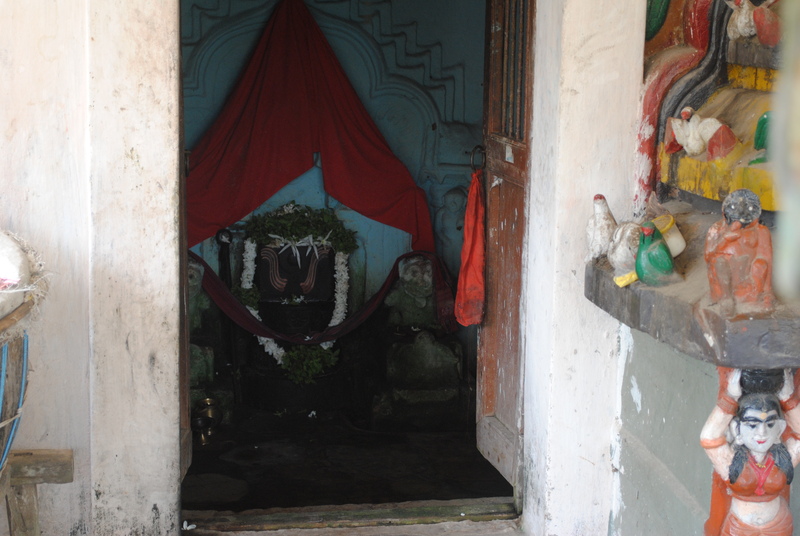 Inner view of the small adjacent temple. 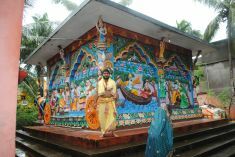 Kuna Mishra, son of Pt Mishra, standing on the temple premises. A side view of the same temple. The authors do not urge to believe on the absolute precision of the answers, but if the questions are not too abstract (e.g. how to fly instantaneously), the answers are more than just satisfactory. Also, the phenomenon described is a fact and is open to one and all. Anyone can follow the route described above and examine in his/her own way. Prevalently, the oracle gives the answers in Oriya language, but I am aware that there was another one (or more) which are multi-lingual. I suppose, if still available, upon request, Pundit Amareswar Mishra will also use the multi-lingual Pothis (made up of other metals); but I cannot promise whether he will definitely fulfill your wish. 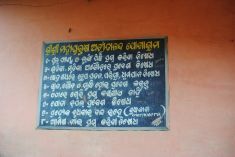 Also, it might be difficult for the operator (Pt Mishra) to read these languages as he has no formal language-education. So its better to get the answers in Tâmrapothi in Oriya and take the help of a translator if one does not know Oriya. However, for the sake of realizing the fact, one can request and try to see that. One can also carry a dictation machine and record what he speaks aloud to analyze later. In the whole event, anybody can see the instantaneously appearing letters/sentences and explanations and that your thought-process is actually being read ! This oracle is probably one of the few existing wonders, that is open to all and can also be independently verified. It is not limited to any religion, language, or nationality as long as one follows the basic regulations (described above) and is modest while asking questions. Arrogance and pride are not going to help; but unbiased inquisitiveness (with modesty of course) is not unwelcome. The Pundit is providing service via Copper Oracle for more than 25 years (since 1980 apprx.). Everyday (except Wednesday, eclipse-days, and Garoi function days) it serves between 20 to 50 people on various issues like job, disease, social complications, Sadhanas (spiritual practice) including mantras, yantras, business issues, etc. It is an undisputed-Wonder created by the great saint Mahapurusha Achyutananda. As is heard by the author from some reliable sources of the Garoi Ashram, the time of Yuga Karma is very close. Most probably, the service will be closed soon for the public once the Yuga Karma proceeds rigorously. Meanwhile, Baba Shri Buddhanath Das also decidedly left his mortal body, to act from the Shunya, leaving behind the Pothi in a working condition for the Yuga Karma to be performed in discipline. So the authors cannot guarantee how long it will be allowed for the public, but as of 15-Sep-2014, it is still working and is expected to be open to all at least for some time (we shall make every effort to update any newer info here, if available). Strange are the ways of the divine, which at times surpasses the human understanding to confirm the fact that, there is something beyond what we have perceived so far or what we can perceive. It is as foolishness as to reject a fact out of prejudice as to accept certain things blindly. Accepting blindly is the characteristic of a gullible mind; at the same time rejecting facts because of limited experience, knowledge, exposure, and prejudice is a strong indication of "lack of imagination, vision, and understanding". Therefore, the authors would recommend the devotional-hearted and the inquisitive-minds to witness this exceptional divine instrument, in person, before Shri Achyuta and Baba Buddhanath Das draw it back to another prolonged state of hibernation once Achyuta's Yugakarma will be close to completion. 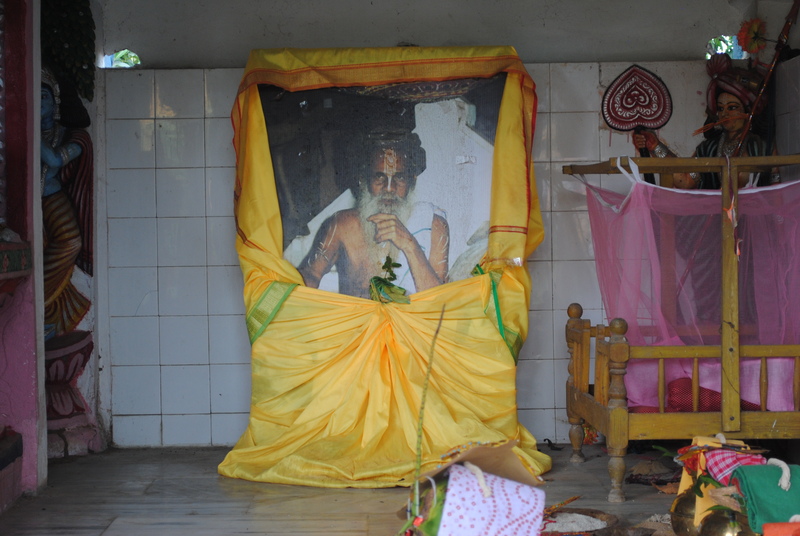 If you wish to share your experience with the Copper Oracle, please send an Email at info@garoiashram.org. Your words will be published under Rare Experiences page. Your identity will be kept open or aliased (if you prefer so). Off note: sharing valid information is not about proclamation, but about informing others what might be a key helping point in their lives. The things and knowledge that we enjoy today is because some of its previous prototypes or entire information was stored and passed on by our predecessors.